Hello, Hello! Hope you're all doing great this Monday morning! Long ago, I was advised to do an organization challenge. One that will motivate others to bring Delightful Order to their home and life. Well, time just keeps ticking and this blog has been up and running for a little over 2 years now and I have yet to give you all a challenge. #1 - I need a little motivation myself! Really, I do. I actually have a lot of different areas that aren't quite finished and I'm ready to finish them. #2 - I believe that if I challenge you, I'm actually challenging myself, because I've now committed to coming up with a space/area, organizing it and then posting the challenge for you. #3 - What a better way to do the above than to have you all join me. 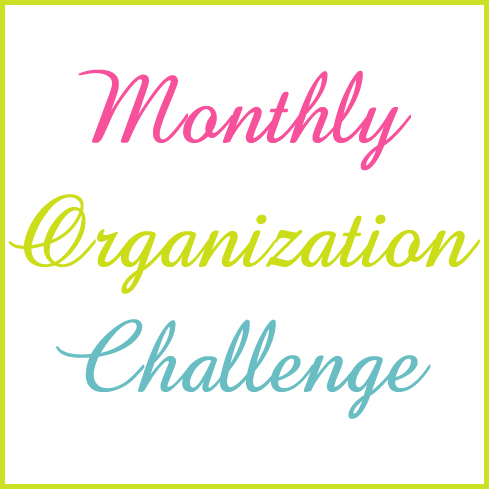 This is a 12 month organization challenge. Each month we will focus on a different space/area of our home & life. Each will be broken down into smaller, more do-able parts. This is not an overwhelming HUGE process. Remember how I've talked about taking itsy, bitsy baby steps? Well that's exactly what it will be ~ just one space/area per month, broken down for you! You have an entire month to bring Delightful Order to that space of your home and life. Are you ready to bring some delightful order to your home? to your life? Just think of how much better you'll feel when you begin reclaiming some space. Give the gift of that same feeling to others by spreading the word about this challenge and asking them to join in. We can all help each other out and inspire others. You don't need to have a blog to join us ~ all are welcome to join, BUT if you do have a blog I simply ask that you grab the button (above) and post it on your blog, pin it, announce the challenge on Facebook. Whatever you choose, just invite your family and friends to join in. So who's ready to become more organized in 2013? The very first challenge starts tomorrow, January 1, 2013 so be sure and come back to begin this journey with me. Click here to be directed straight to the list that breaks down the challenge by month. I'm in! I've already started organizing and will need the motivation to keep going. Your Challenge sounds like a great motivator for me. This is very similar to what I plan to do myself over the next year. I'm hoping your spaces will line up with what I have planned. I can't wait to see what you're doing first. I'm in! Can't wait to get started. Hoping your first challenge is the Master Bedroom, as that was where I was thinking of getting started, but I'll wait to tomorrow to see where we're headed! I'd love to join in and be encouraged and motivated to organize. Do I need to have a blog though? Because at the moment...I don't. I totally think it would be fun, but seriously do not know the first thing on going about it. Thanks. Hi Kristy! No, you don't need to have a blog to join. Anyone can come along with this journey and I'd be delighted if you did. I'm totally in, this will be perfect! Can't wait for some help and some inspiration. Thank you! Count me in, I will join you and am looking forward to your first challenge tomorrow. Every home can use a little organization here and there so I am convinced that we will learn something and inspire each other during the next 12 months. Happy organizing! Have a good start into 2013. I am in! I have already used some of your ideas so I excited to do more. My new years resolution is to become more organized. So what a better way to be motivated and inspired. I'm in...I think, ha ha! I have prioritized my organizational challenges, but if they come early I'll just save the pics and blog about it later :). Sounds like a good thing to add to get me blogging again in 2013. Hey! I'm going to join you with the organization challenge! I'm NOT organised at all, but would like to be, so I linked up! YESSS!!! I am so overwhelmed with where to start, so I am so excited that I can use this as a guide and a motivation to actually follow through with getting my spaces organized! Thank you so much for this challenge! This was just what I was looking for! I have been working on my resolutions and this is what I needed for one of them. I will be blogging about my progress! We are in! Feeling motivated already and looking forward to first challenge. Count me in! I just found your blog and am smitten. Thanks. Just what I needed. I'm in! Thank you for all of your tips! I am in! I am a working mom of 4 and need to start somewhere. If I am not careful now, I will quickly become overwhelmed. Cannot wait to get going:)Not sure if I want to add blogging to it but it may help keep me accoutable. This is a big focus for me this year, as we are heading toward downsizing/different sizing sometime in the near future, as we have reached the Empty Nest stage of life. I'm sitting in a house that was geared toward raising and homeschooling our four wonderful children. Want to make the move to a new place that will better fit our needs for the future. Want to pass on items we no longer need to others who can use them better now. I'm in! Can't wait to get started! So, if possible, I would like to join too. I'm living in Germany, working 50 hours a week in an office and my household became a little unoranizes. So I hope to get many inspirations of your challenge 2013! And: I would be very gratefull, if you could correct my mistakes in english and show me how to write it correctly! I found your challenge by googling 2013 organizing challenge. I am so excited that this is where you are starting! I am a very organized person, but this is the ONE area that I am lacking in! I look forward to the challenge. I do not have a blog so I will follow along creating a Pinterest board. Thank you! So excited about this!! My blog is called Confessions of a Clutterbug and your challenge is exactly what I needed! Im in! This will be great!!!! I'm joining in. :) But this is one area that is already organized for me. So I am challenging myself to remember to NOT throw away my receipts as soon as I enter them in the checkbook now that I have my own business. I have to now keep the ones that I bought supplies on. I don't have a blog, but do have a Pintrest. I will add you there.